I spent most of the first week preparing for the playtest session on Friday 12th. The playtesting showed me major flaws in aspects of the game, so I decided to forgo multiplayer entirely, in favor of polishing the singleplayer experience. At least until the final delivery date in February. Also, I worked 81 hours on the game total these two weeks, finally reaching the 40hr/week mark I wanted to for so long! The next Review Meeting was on friday of the first week, Jan 12th, and there was also a playtest party organised, which I had absolutely wanted to join. Therefore, I spent most of the first week preparing the game for that. During that first week I had an additional playtest session with a friend, which made clear that I had to add a few more features, before the game was even worth playtesting with more people. So i implemented a lot of Quality of life improvements, such as making the UI all around clearer to understand, hiding the building UI while setting the harvesting area, adding a help button for every subject and building with information about them, adding a physical “Menu” Button in the game HUD, and removing a lot of distracting on-screen print messages. I wrote a Feedback Questionnaire which helped me figure out what I needed to pay attention to while players tested the game, and gave me a way to track what they thought while playing. I also implemented a new building, the Foresting Lodge which plants trees in the specified area. Lumberjacks now only cut trees. The Playtesting session made it painfully obvious that many features weren’t easy for players to grasp without explanation. This began with the Camera controls – there was only a single player (out of 12 testees) who figured out the two major parts of the camera control, the “Freecam” (press mousewheel and move mouse) and the Strafing Movement (WASD+QE). In this part I asked about how quickly players understood the major features in the game. 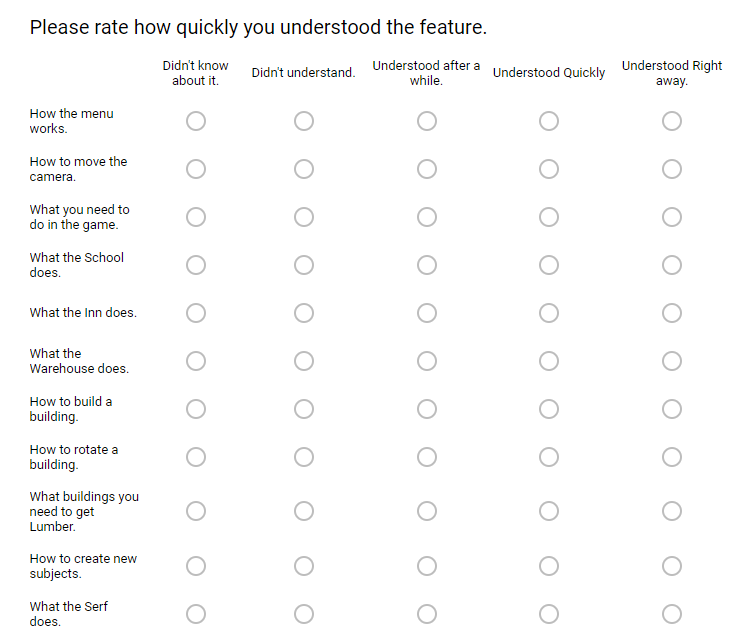 In one part of the two-page questionaire I prepared, I asked players how quickly the understood some of the features that were absolutely needed to play the game properly. The sobering result was that most of the features were only understood after a while, or after my explanation. Generally players could reproduce what they learned easily, and they understood things when they tried them once, such as moving the harvesting area (“What does this button do? *click* Oh okay I get it”). I noted down the things players were saying while they were playing, and observations I made as well, and then evaluated these notes and turned them into “TODOs”. I tested multiplayer first, because it was the thing I had spent so much time on during the previous month. But just a few minutes into it I saw that it had critical problems in the networking code and game design, making it virtually unplayable. So after that i only tested in singleplayer mode. After seeing the issues players had to understand basic concepts of the game, I quickly decided to prioritise a proper tutorial and other systems to support the player (such as the notification system). I also reluctantly decided to drop multiplayer for the time being, as it wasn’t feasible to fix the issues while also polishing the basic experience of the game. This hurt, because it meant that around two or three weeks of development would have been for naught. But “Kill your Darlings” right? Besides the negative results, I also got a good amount of constructive feedback. There were a few features that multiple players asked about which I planned to implement – such as speeding up the game time – and the few testers that were actually part of my target group said they generally enjoyed the game, and saw good potential in it. I had originally intended to start with the implementation of combat in week 16. But now I knew I had to focus on all the things I had gathered from the playtesting sessions. I began with a lot of tweaks to the UI. The buttons on the right were now formatted properly. I changed the Icon of the Serf from the “Atlas” image to a Wheelbarrow. The “Go to Staff” Button in buildings is now greyed out when a subject hadn’t been assigned yet, instead of not showing up at all. Lots and Subjects now showed their icon with the player label, instead of the building / subject type as a word. Buildings and Subjects now also have their respective Icon floating above them. This is a temporary solution, until I have proper 3D models, but it works perfectly – thanks Nanette! Most importantly, I implemented tooltips. Hovering over any button now gave a little hint about what it did, and for most of them, showing the tooltip a little longer will display additional information in the tooltip. I also renamed “Subjects” to “Citizens” (in player-facing text) because the term wasn’t clear to players. I also planned to rename the Serf, but I hadn’t settled on a new name yet. I implemented the Game-Speed feature, allowing players to play between 0.001x (virtually 0), and 32x game speed (in powers of 2). A particular issue I managed to catch in playtesting thanks to Pierre had to do with placing buildings too close to another. I had had this in the back of my head for a long time, but since I finally saw how wrong that could go, I made sure players couldn’t place buildings so close to another, that the navmesh could be cut off completely. Another large chunk of the second week was spent working on the Jobmanager. It turned out that I had never actually dealt with Serfs dying during a job, so playing for a long time, with a few serfs dying of hunger, would irreparably ruin the job manager. I also improved efficiency of jobs to some point, but not yet as much as I intended to do until the final delivery. Finally, I implemented a notification system. This system was originally designed to let the player know of issues in his economy, such as subjects dying of hunger, or a building being unoccupied by staff for some time. I realized however, that i could use that system for the (much needed) tutorial as well! I checked the playtesting results and noted down which features absolutely needed a tutorial, and started making it. I had something like a tutorial for the playtesting session, but it was just a static textbox telling the player to build a woodcutters’, which didn’t disappear when the player completed the task, so it only confused players even more. This new tutorial was dynamic, when a player completed the current task, there would be a sound, and the tutorial could now be dismissed, showing the next tutorial. Also it was animated and looked pretty decent. 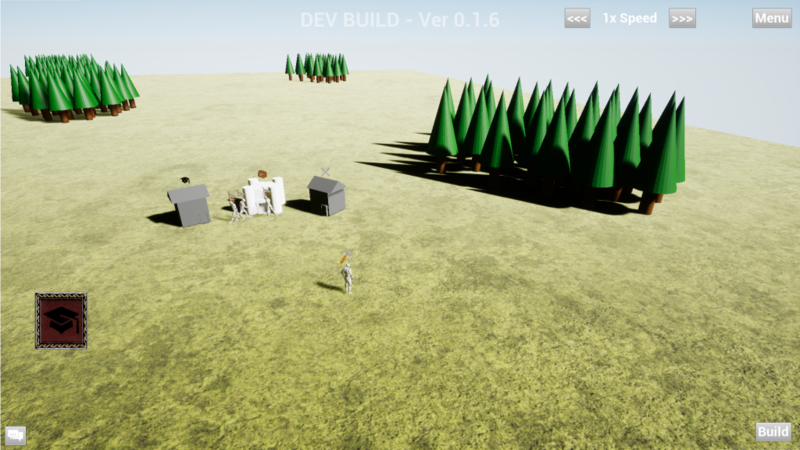 By the end of week two I had implemented a tutorial for opening UI, moving the camera, and a tutorial explaining the Log->Lumber chain, and how to construct buildings. State of the game on January 21st 2018. For the first time in a while, something clearly changed. In the top right you can see the new Gamespeed buttons and the Menu button. In the bottom left you can see the Icon with the Student Cap, which is currently bouncing around, playing the “Unread” animation. Above the buildings and citizens you can also spot their respective icons.